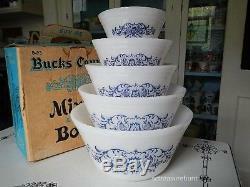 Vintage Federal Milk Glass Blue Bucks County Mixing Baking Bowls MINT BOXED SET. 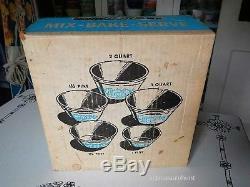 Vintage unused boxed set of milk glass mixing, nesting & baking bowls. 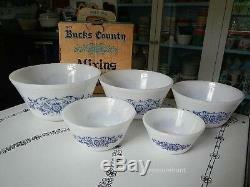 Set of five, 3qt, 2qt, 1 1/2pint, 1 1/3pint, 1 pint, sizes are 9", 8", 7", 6" & 5. 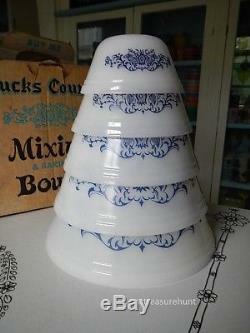 White milk glass with a blue print. Condition is mint in the original box, NO use wear, NO damage, they are super bright and shiny! 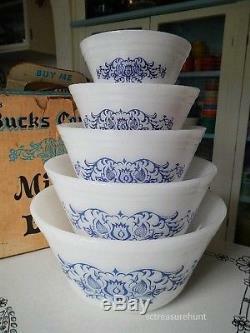 Something to note that the largest bowl's print is not as dark as the smaller bowls. Original box has wear (please see photos). 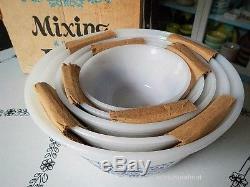 Set of five fabulous nesting mixing bowls in the original box! 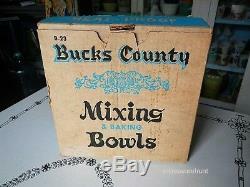 The item "Vintage Federal Milk Glass Blue Bucks County Mixing Baking Bowls MINT BOXED SET" is in sale since Sunday, January 20, 2019. 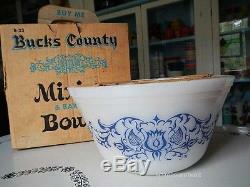 This item is in the category "Pottery & Glass\Glass\Glassware\40s, 50s, 60s\Federal"." and is located in North, South Carolina. This item can be shipped to United States, Canada, United Kingdom, Denmark, Romania, Slovakia, Bulgaria, Czech republic, Finland, Hungary, Latvia, Lithuania, Malta, Estonia, Australia, Greece, Portugal, Cyprus, Slovenia, Japan, China, Sweden, South Korea, Indonesia, Taiwan, South africa, Thailand, Belgium, France, Hong Kong, Ireland, Netherlands, Poland, Spain, Italy, Germany, Austria, Bahamas, Israel, Mexico, New Zealand, Philippines, Singapore, Switzerland, Norway, Saudi arabia, Ukraine, United arab emirates, Qatar, Kuwait, Bahrain, Croatia, Malaysia, Brazil, Chile, Colombia, Costa rica, Panama, Trinidad and tobago, Guatemala, Honduras, Jamaica, Antigua and barbuda, Aruba, Belize, Dominica, Grenada, Saint kitts and nevis, Saint lucia, Montserrat, Turks and caicos islands, Barbados, Bangladesh, Bermuda, Brunei darussalam, Bolivia, Ecuador, Egypt, French guiana, Guernsey, Gibraltar, Guadeloupe, Iceland, Jersey, Jordan, Cambodia, Cayman islands, Liechtenstein, Sri lanka, Luxembourg, Monaco, Macao, Martinique, Maldives, Nicaragua, Oman, Peru, Pakistan, Paraguay, Reunion, Viet nam.